Design projects are a fun time in any homeowner’s life with all of the new colors and accents; it’s enough to make your head spin. If you live in an older home, chances are there are a few things you want to change right away, such as that ugly wallpaper left by a previous owner. 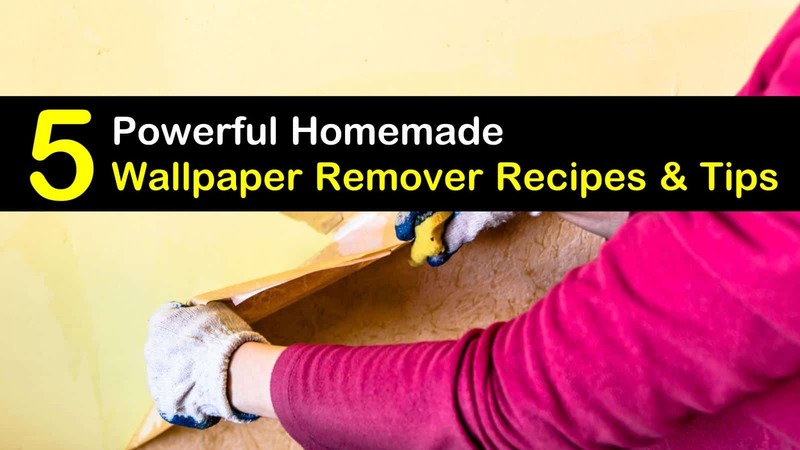 Lucky for you, this article includes several recipes and tips on how to make homemade wallpaper remover, thus saving you from having to buy a giant bottle of chemical-laden wallpaper remover. At the beginning of your wallpaper removal project, no matter which DIY wallpaper remover you choose, make sure you have the following items: a spray bottle, a scoring tool, some paper scrapers or a putty knife, sponges (a sponge mop would be easier) or a paint roller, and a drop cloth at the start of your project. Once you have these tools at hand, you are ready to remove that old wallpaper with these step by step recipes! An easy way to make wallpaper adhesive let go is to use white vinegar. One of the components of vinegar is acetic acid, which has the chemical properties to help unbind adhesive glue, making it a great tool to remove wallpaper. You can follow this recipe for a vinegar and water mixture. Use a scoring tool to create small perforations in the wallpaper. If the wallpaper is already peeling, you can peel off the top layer of paper. Then, mix in a spray bottle or a bucket equal parts vinegar to equal parts water. Generously spray or apply the vinegar and water mixture to the walls. Let soak for 15 minutes. Scrape the wallpaper with the tool of your choice. The vinegar all-purpose cleaner will also deodorize your home and act as a natural mold killer (especially when mixed with baking soda). By using fabric softener, the wallpaper adhesive will break down and make it easier to tear the wallpaper away from the wall. Use your scoring tool to create small holes in the wallpaper. Mix equal parts fabric softener and hot water in a spray bottle. This method works best by focusing on small areas and slowly working your way across the entire wall. Saturate the wallpaper with the fabric softener spray and let it soak for a few minutes. Use a putty knife to peel the wallpaper away from the wall. A combination of dish soap and fabric softener will also give you the extra power to remove that stubborn wallpaper. Add dish soap to hot water in a bucket. Use this water mixture to saturate small sections of wallpaper and begin peeling the wallpaper. If you need some extra help, mix fabric softener, dish soap, and warm water in a spray bottle. Then, using your spray bottle mixture, spritz the wallpaper adhesive for easier wallpaper removal. By using a conventional clothing steamer, or renting a wallpaper steamer, you can break down the wallpaper paste. You’ll want to slowly move the steamer so that the steam has time to work on one area. When the wallpaper bubbles up, the steam is working. Take your scraper or putty knife and peel the wallpaper away. This is helpful around any wooden molding or accents that you don’t want to saturate with soapy water. Dish detergent is incredibly useful for eliminating grease from your dishes, but did you know that it is also an effective homemade wallpaper remover? If you have pieces of stubborn wallpaper or wallpaper adhesive, mix a tablespoon of dish detergent with 1 cup of hot water. Use a sponge to wipe down the walls and remove the remaining wallpaper or wallpaper adhesive. You can use a scraper or putty knife for extra help. 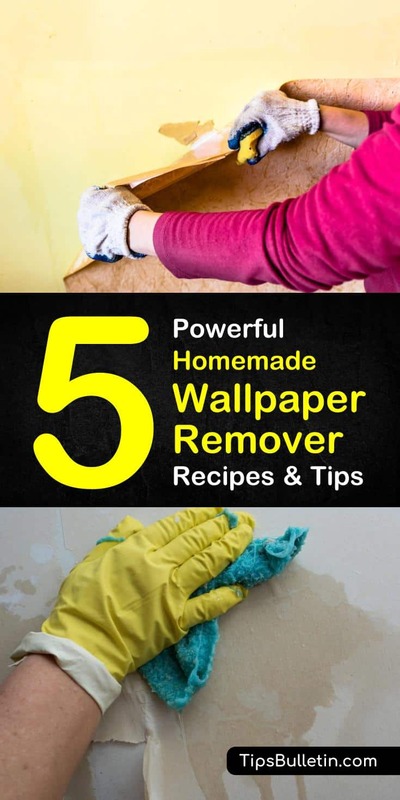 Hopefully, these step by step homemade solutions give you a DIY wallpaper remover you want to try! No matter how much wallpaper you need to remove, from a small area to an entire wall, there is a wallpaper removal solution for you. If you know someone who is about to start a redesign project at home, then please share this article on Pinterest and Facebook to make their wallpaper removal less of a headache and more about therapeutically ripping large sheets of wallpaper off the walls (safely, of course! ).